Luck tends to be on Neena “Domino” Thurman’s side, but in the current Domino ongoing series, fortune isn’t as reliable as usual for the superhero assassin. Writer Gail Simone has thrown a wrench into Neena’s mutant power to give herself good luck, forcing her to find new solutions to problems that would usually be answered by random outside influences. 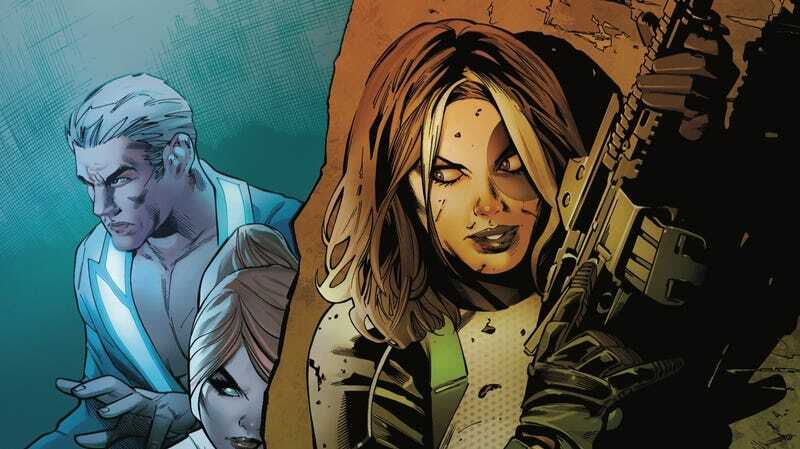 Working with artist David Baldeon and colorist Jesus Aburtov, Simone delves deeper into Neena’s solo character by spending time on the childhood trauma that shaped her into an assassin, giving her new villains with connections to her past. Simone writes a fierce Domino who’s still formidable even with her malfunctioning powers, but the most compelling thing about this series is how Simone explores the intersection of Neena’s personal and professional life, giving her a supporting cast of superhero colleagues to work and play with. Simone gives Marvel its answer to do DC’s Birds Of Prey (a series she wrote for years) with the trio of Domino, Outlaw, and Diamondback, and Domino taps into the globetrotting adventure tone of BoP while similarly taking advantage of the rich history of this superhero universe. Neena recently started training with Shang-Chi, Master of Kung Fu, to reactivate her mutant ability, and the introduction of this classic Marvel hero as a love interest adds another personal/professional complication to the narrative. It also allows for some fun continuity mining, and this exclusive preview of next week’s Domino #5 has Neena and Shang-Chi ambushed by a bunch of his villains, bringing back some evil faces who haven’t been seen in years. This issue has Michael Shelfer filling in for David Baldeon, who still provides page layouts to keep the visuals consistent. Shelfer’s art is a bit more angular, but he matches the animated energy of Baldeon’s work, which is reinforce by Aburtov’s vibrant coloring. This excerpt ends right before the action breaks out, but with Domino and Shang-Chi fighting side-by-side, readers can expect a vicious kung fu bloodbath when all hell breaks loose.